Vanadium is a key component in steel, but it has other emerging applications as well. Learn about vanadium mining and the deposits this industrial metal comes from. 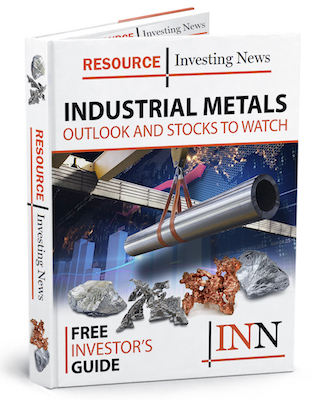 Investors interested in vanadium mining should have an understanding of the places this industrial metal is found and the main deposit types it comes from. World resources of vanadium currently exceed 63 million tons, according to the latest data from the US Geological Survey, with the top producers being China, Russia and South Africa. China came in well ahead of the pack in 2017 with output of 43,000 MT. Some may be surprised to learn that vanadium is a trace element — that means it is widely distributed in nature, with its average abundance in the continental crust coming in at about 60 parts per million. As a result, vanadium is usually produced as a by-product or co-product of other materials. The materials vanadium is found alongside vary widely. The metal can be found in deposits of phosphate rock, titaniferous magnetite and uraniferous sandstone and siltstone, where it makes up less than 2 percent of the host rock. Vanadium can also be found in bauxite and carboniferous materials like coal, crude oil, oil shale and tar sands. All in all, because it of its wide distribution, world resources of vanadium “are understated and therefore not fully indicative of available supply,” the US Geological Survey says. That said, there are four main types of mineral deposits where vanadium is present in economic concentrations: vanadiferous titanomagnetite (VTM) deposits, sandstone-hosted vanadium deposits, shale-hosted vanadium deposits and vanadate deposits. Read on for an overview of these four deposits. VTM deposits are found worldwide, and are the main source of vanadium, according to the US Geological Survey. The most economically significant VTM deposits are located in: South Africa’s Bushveld Complex; China’s Panzhihua layered intrusion; the Russia-based Kachkanar massif; Western Australia’s Windimurra Complex; and the Bell River and Lac Dore complexes, both in Quebec. These vanadium deposits are hosted mainly within mafic and ultramafic igneous rocks, and are made up of magmatic accumulations of magnetite and ilmenite. For the most part they contain 0.2 to 1 percent V2O5, but some areas have over 1.5 percent V2O5. Areas like that include the Bushveld Complex. The US Geological Survey pegs the Speewah deposit in Western Australia as the largest example of a VTM deposit. Owner King River Copper (ASX:KRC) says Speewah is one of the world’s largest undeveloped titanium-vanadium in magnetite deposits, with a measured resource of 322 million tonnes at 0.32 percent V2O5 and 2 percent titanium, and an indicated resource of 1,054 million tonnes at 0.33 percent V2O5 and 2 percent titanium. As mentioned, vanadium is often produced as a by-product or co-product of other materials. One of those materials is uranium — the US Geological Survey notes that sandstone-hosted uranium deposits are found across the globe, with many having enrichments of vanadium. Vanadium concentrations in sandstone-hosted vanadium (SSV) deposits generally stand at 1 percent V2O5 or higher, although some deposits have grades of over 2.5 percent V2O5. SSV deposits tend to be the highest-grade vanadium deposits, but most are small (less than 1 million MT of ore). In the US, SSV deposits are the main source of vanadium, with deposits located on the Colorado Plateau being key. US-based SSV deposits can also be found in Eastern Utah, as well as Northern Arizona and New Mexico. Other SSV deposits globally include: the Bigrlyi deposit in Australia; deposits in the Tonco-Amblyo district in Argentina; and a deposit in the Karamurun district of Kazakhstan. Vanadium-rich metalliferous black shales are found mainly in late Proterozoic and Phanerozoic marine successions. Concentrations in these vanadiferous black shales regularly exceed 0.18 percent V2O5, and can be as high as 1.7 percent V2O5. The US Geological Survey says that “well-characterized” vanadiferous black shales include: the Nevada-based Woodruff Formation; the Doushantuo Formation in China’s Hubei province; and portions of the Toolebuc Formation in Queensland, Australia. However, the publication points out that while black shales “have long been recognized as potential sources of vanadium, they are not currently exploited.” It notes that development is underway at Prophecy Development’s (TSX:PCY) Gibellini vanadium prospect in the Woodruff Formation, and it will be the first primary shale-hosted producer of vanadium in the US if it moves into production. The copper–lead–zinc vanadate ores in Northern Namibia were once considered among the largest vanadium deposits in the world, says the US Geological Survey, and other areas with vanadate deposits include Angola, South Africa, Zambia and Zimbabwe. However, vanadate deposits largely stopped supplying vanadium in 1978, when Berg Aukas, the last producing mine in Northern Namibia, closed. Other magmatic-hydrothermal vanadium resources — Some magmatic-hydrothermal niobium-titanium deposits contain elevated concentrations of vanadium, the publication says. Additionally, heavy mineral concentrate samples from iron ores in Sweden and Chile have reported high concentrations of vanadium, while some gold-quartz veins contain roscoelite and other vanadium-bearing minerals. Fossil fuels — Vanadium correlates closely with organic carbon, and is enriched in many oil shales. For that reason, “minor amounts” of the metal are produced as a by-product of coal and tar sands. Now that you know more about where vanadium mining happens, which deposits do you think have the most potential? Tell us in the comments. This is an updated version of an article originally published by the Investing News Network in 2010. Atlantic Ltd has been sold to Droxford International Ltd. and ATI was delisted at ASX at 26 Sep 2016. Thank you for your comment and apologies for the oversight. We have removed the company from the article, and it has been updated as of Nov. 30. You really ought to have your (technical) articles properly reviewed by (in this case) a geologist. The number of basic errors negates any value that this article may have had. Thank you for your comment, the article has been updated as of Nov. 30, and includes up-to-date companies. Thank you for reading and for your comment. The article has been updated entirely and includes Bushveld Minerals. Interesting article nut not complete. What about VanadiumCorp’s deposit in Quebec ? See Quebec Mining: Global Business Reports: Adriaan Bakker. Thank you for pointing this out! The article has been updated entirely and includes VanadiumCorp. Poor quality article. TNG is close to firing up one of the worlds largest vanadium deposits in the Northern Territory, permits and off takes in place, where is the mention? Thanks for reading and for pointing out this oversight. The article has been updated, and it also includes TNG. Trying to find Vanadium Mining Stocks on the OTC Exchange-are there any? If vanadium has good prospects, why did Vantra Vanadium close? Any chance of restarting operations of Vantra vanadium? I would like to contact vanadium-mining companies interested to invest in a new Fe-Ti-V mining project (titaniferous magnetite deposit) in Angola. Bushveld-type of deposit with substantial resources with high-grade TiO2 and V2O5. Is the Angolan V205 project you mentioned still available? What about Prophecy Development Corp.
Do you know about Ragra mine of Vanadio in Peru?